Home › Blogs › Shoes, Brews, & Maine Running News › Bring on the Heat! I want to start by saying congratulations to everyone who participated in a spring race or races. 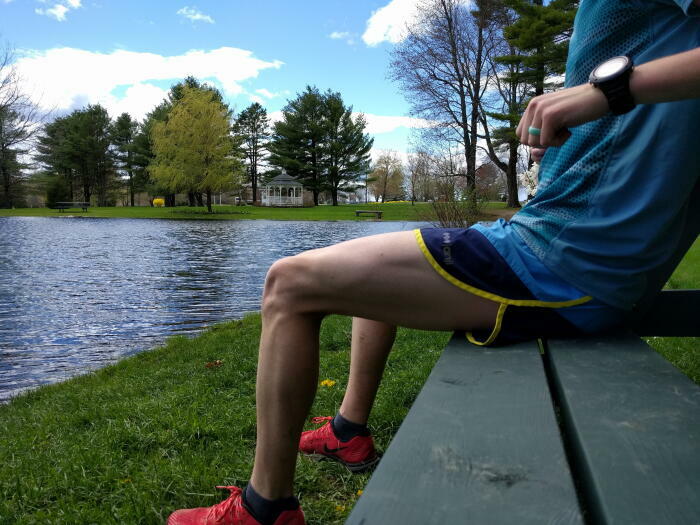 A few of you still have the trail festival at Pineland Farms or the Vermont City Marathon coming up this weekend, but after Memorial Day Weekend we step into the unofficial beginning of summer training and racing! Summer running presents its own opportunities and challenges, and our brief taste of 90 degrees this past week was a good reminder of what to be prepared for. Let’s start with the heat. The first few really hot days can be tough on the running. Our bodies need to acclimate to the heat and humidity the same way they need to acclimate to the cold in the winter. Studies have shown that running in extreme heat and humidity to have comparable effects to training at altitude, and that it may actually be more beneficial. So don’t be too discouraged if you feel terrible on your first few runs in the heat. As the temperatures start to cool at the end of the summer, you should feel the benefits from training in the hot weather! As our bodies relearn to sweat, it’s also important to talk about hydration. Overall, 60% of your body is water. Muscles are 79% water. Bones are even 31% water. Staying hydrated is an essential part of staying healthy when training, especially in the heat. Having a hydration plan for before, during, and after your run is important for performance and recovery. Another important summer consideration is sun exposure. The health benefits of sunlight are huge. Sunlight is one of the best ways for your body to soak in Vitamin D. But you should also be aware of protection from harmful UV rays. If you don’t like sunscreen, consider wearing a hat or shirt with some built-in sun protection to save easily burned areas like your nose, shoulders, and back. Another easy solution is running early in the morning or a little later in the evening to avoid the sun at its peak. Summer is also a great time for trail running. Running on trails breaks up the monotony of the roads and helps strengthen your legs. The trees also provide some nice shade. If you are looking for some trail races, groups like the Trail Monsters and Baxter Outdoors are putting on a lot of great events. There is a little something for everyone! One of the only downsides, depending on where you run, can be the bugs. You’ll see different types of flies more than anything else while running. But it’s also important to check for ticks afterwards. You can minimize the risk of tick bites by staying on the trail and not wandering into tall grass or brush. Washing up soon after you finish running helps as well. And one of the best parts of summer running is National Running Day on June 7th! We’ll be hosting a celebration at our Portland location with, of course, running as well as free beer and pizza! Hopefully we’ll see you there!